Is the ČZ-52 Really Stronger Than Other 7.62x25mm Handguns? 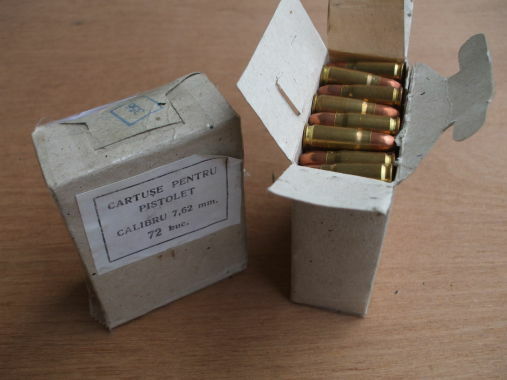 "Only the Czech ČZ-52 pistol is sturdy enough to handle that hot 'Czech load' 7.62x25mm ammunition!" Maybe! But the dimensions suggest otherwise. Let's look at their barrels and chambers, and let's think very carefully. 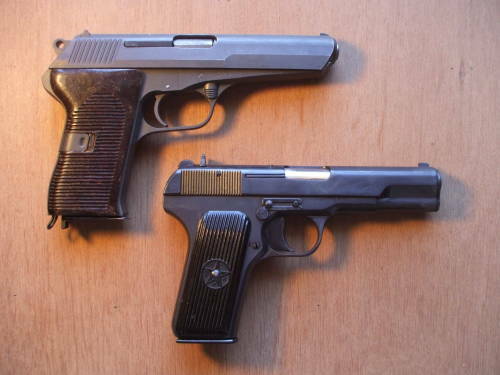 Here are two 7.62x25mm pistols, the Czech ČZ-52 and the Romanian TTC, a copy of the Soviet TT-33. 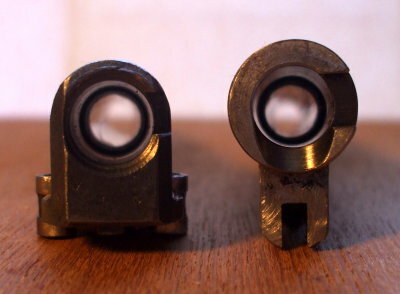 Both fire the 7.62x25mm cartridge. Let's compare their barrel and chamber wall dimensions. Safety first! Start by making absolutely certain that everything is unloaded! 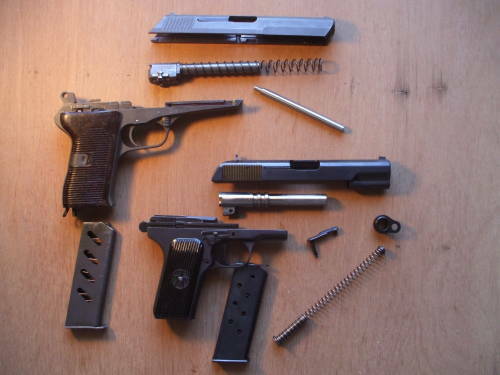 The two pistols have been field stripped, see this site's directions for field stripping the ČZ-52 and TT-33 / TTC. The ČZ-52 slide is easily removed from the frame. The barrel and its spring are then removed from the slide using a punch or, better yet, a specialized takedown tool. The TTC / TT-33 breaks down much like the M1911. Its spring seems stiffer than the one in the M1911, or at least it is harder to control. Wear safety glasses when you disassemble it! Here are the two barrels, viewed from their right side. The ČZ-52 barrel is at top, the TTC at bottom. You can start to see the unusual roller bearing design of the ČZ-52. There is a much better view below. 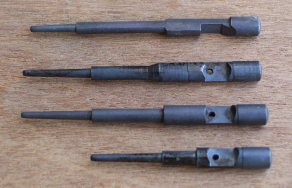 The locking lugs of the TTC barrel extend around the barrel, although the mating lugs on the slide are only on the top half. 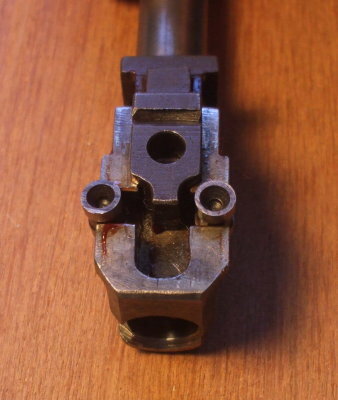 This design is just as strong but easier to manufacture than the partial lugs as found on the M1911 barrel. This rear view shows the chambers of the two barrels. The ČZ-52 is at left, the TTC at right. You can start to see here that the TTC has sturdy chamber walls. A casual glance suggests that it is at least as thick as the ČZ-52 chamber walls, if not thicker. 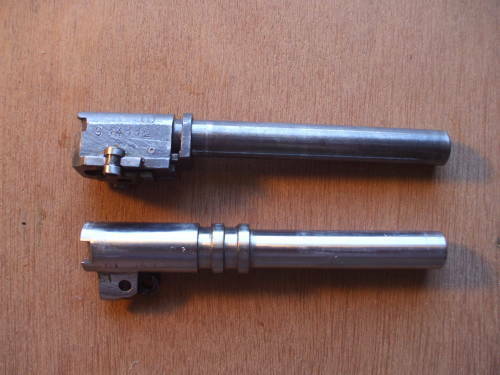 The ČZ-52 barrel has been flipped over and we are looking at the bottom. We see the roller bearing action. The roller cam is forward, and it would allow the rollers to move in toward the centerline. The ČZ-52 action locks up with the roller cam fully to the rear, toward our viewpoint. 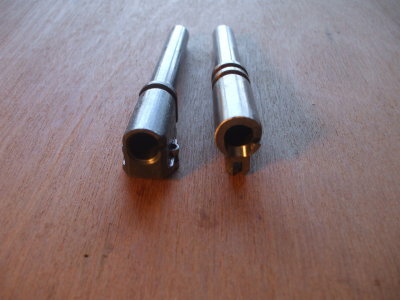 This locks the rollers out into mating notches within the frame interior, firmly locking the barrel in place. Notice the slot in which the roller cam travels. The base of this slot as we see it here is the outer face of the chamber wall at the bottom of the chamber. We need to measure the depth of this slot to subtract it from the apparent thickness of the chamber bottom wall. This slot is 0.235" deep. Here is a rear view of the two chambers, the ČZ-52 at left and the TTC at right. The distance from the bottom surface of the ČZ-52 chamber to the bottom of the roller cam block is 0.300". But remember that the block has a slot 0.235" deep, so the metal at the bottom center of the ČZ-52 chamber is 0.300 – 0.235" or 0.065" thick. Chamber OD L-R 0.585" 0.645"
Chamber wall, top 0.095" 0.120"
Chamber wall, left 0.100" 0.120"
Chamber wall, right 0.100" 0.125"
Chamber wall, right 0.065" 0.130"
This table lists the measurements I found for the two. For comparison, a Norinco M1911A1 has chamber walls 0.105" to 0.110" thick. So, is the ČZ-52 really stronger, or is it possible that the thicker walls of the TTC make it the stronger pistol? It would depend on the maximum tension yield strength of the steel used in the two pistols. However, if the two are made from equivalent steel, the TTC has thicker chamber and barrel walls and would be stronger. What does this mean about selecting ammunition for 7.62x25mm handguns? As always, be extremely careful when selecting ammunition. First, verify that it is the correct type. As discussed on the 7.62x25mm page, 7.62x25mm Tokarev is physically very similar to 7.63x25mm Mauser or .30 Mauser. Second, verify that the ammunition and gun are in good shape. The pistols are military surplus manufactured several decades ago. The ratio of stress values would therefore be proportional to the ratio of chamber wall thicknesses. The ČZ-52 chamber wall would experience stress 20% to 26% greater than that of the TTC at the left, top, and right sides, respectively. This is based on the thin-walled assumption, valid for a wall thickness no more than about one-tenth its radius. That is not the case for these chambers, meaning that an accurate calculation would require much more complicated equations. Thicker is definitely stronger, it's just complicated to calculate precisely just how much stronger. I am worried by all the interest in extra high power ammunition for the ČZ-52. There is all this talk about "even hotter" loads, and enthusiasm for how it can defeat certain classes of ballistic armor. I just don't anticipate any need for me to drill holes through bulletproof vests. My take on this is that Romanian surplus is powerful enough. If I found a good deal on actual Czech surplus ammunition, I might use it, although I would be very careful to verify that it was intended for use in the ČZ-52 pistol and not a submachine gun like the Czech ČZ Model 25, properly known as the Sa.25, Sa.48b, or samopal vz.48 výsadkový. Notice how the Romanian ammunition shown here is marked as appropriate for use in a pistolet. I would be careful to keep it in its original packaging and use it only where appropriate. And, if someone offered me "Czech loads" in anything other than actual Czech packaging, possibly hand loads, I wouldn't even want to be close when they recklessly fired it.